The Cataplana: Secret Portuguese steamer for making mouthwatering cuisine! Cataplana: The traditional Portuguese cooking vessel explained! The Algarve and the summer season seem to be synonymous with its white sandy beaches, sapphire blue and aquamarine ocean waters, and of course, the food which is full of the “fruit of the sea”. The abundance of fresh seafood, fish and sun-ripened vegetables is what I dream of when I think of taking holiday in the summer lands of Portugal. Alas, it’s a bit of a trek from the center of this beautiful country where I live, but that doesn’t mean there is no hope of having a taste of the Algarve in my own kitchen. Learn to cook Algarvio food with Catavino! The cataplana is well known to have originated in the Algarve, where it’s now seen as a symbol of the cuisine. There are two main theories where it came from, the first and most widely spread is that it came with the Moorish occupation of the region back in the late eighth century. 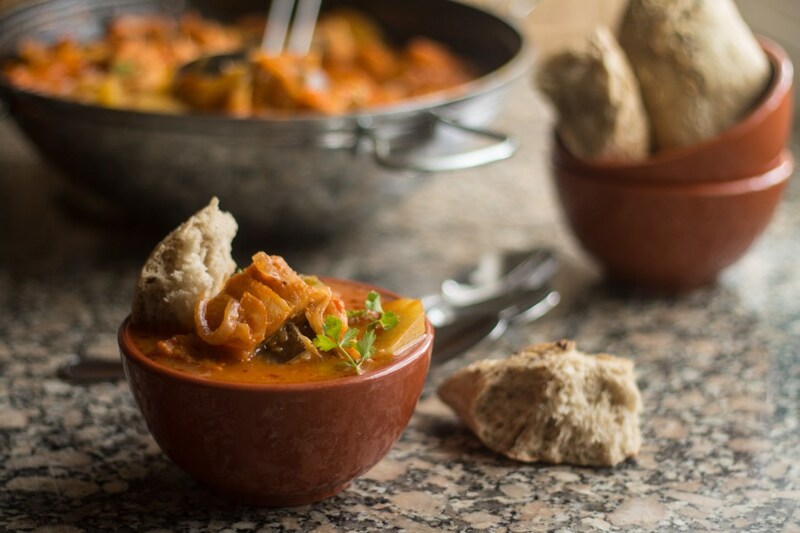 Some believe that it is the Portuguese equivalent of the tagine from northern Africa, and it has more than just a similar cooking process; both dishes also have whatever is made inside named after the cookware! The other, and less heard the theory is that it was made by a Portuguese metal craftsman specializing in copper and stainless steel named Armando Luz (1927-2002). Traditionally the cataplana was made out of beaten copper in the shape of a clam shell, this made it easy for hunters and fishermen to fill it up with the essentials like garlic, onions, olive oil, and the vegetables of the season to take with them in order to cook their fresh game and catch right there over a fire, be it just off a boat or out in the forest. The cataplana would act much like a pressure cooker in that it would steam the fresh food inside, locking in the flavors and juices while cooking. This made the process fairly quickly without too much extra effort other than throwing everything into the pan and letting it simmer away. Nowadays, you can find the cataplana in many restaurants in the Algarve as well as outside it. Served to the table inside the uniquely Portuguese pan, the dish usually includes clams, fish, mussels, and shrimp but even that varies depending on the region. With its seafood concentrated robust sauce, it’s wonderful served with al-dente portuguese rice or boiled potatoes, and crusty bread. My first experience using a cataplana came when my sogra (mother-in-law) gently handed me a “suspiciously familiar” white box filled with a beautifully clam shaped cooker. The outside was made from aluminum with a non-stick coating on the inside. Not exactly traditional, but it’s just right for a kitchen at home. From the information I gathered, one basically just creates a refogado (sautéed garlic and onion in olive oil) in the bottom of the pan then add in the rest of the ingredients, a bit of liquid (usually wine, water or broth, and sometimes a mixture of all three), bring it to a simmer over medium heat, clamp the top shut and allow it to simmer over medium-low or low heat for 10 to 30 minutes depending on what’s inside. This is truly one of the easiest dishes to cook in! The more I worked with the cataplana the more I realized this dish isn’t just for shellfish. It can be used for vegetarian stews, chicken, rabbit and seafood rice or arroz de marisco (seafood rice) and a variety of different fish dishes like a Caldeirada de Peixe (fish stew). Cooking in the cataplana makes the flavors richer by not allowing the juices to go to waste by evaporating into the air and instead continuously sinking back into the food and creating a luscious liquid in the bottom. 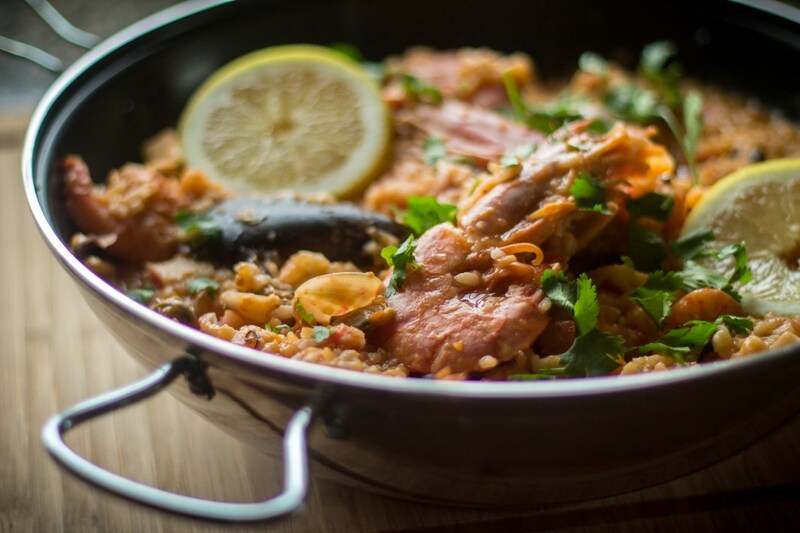 Try one of our two cataplana recipes at home: Caldeirada de Peixe (fish stew) and the Arroz de Marisco Cataplana (seafood rice), or come join us in Portugal for a customized food tour just for you! Get in touch with Catavino to book your Algarve food and wine tour!